Polar Marine is proud to now join Globalstar as a partner. We recognize the unique communications challenges in Alaska as we work and play in the Last Frontier. Cell phones and VHF radios only go so far, and today we depend even more on timely information and necessary communication. Of particular interest is the most economical voice/SMS/data satellite service in the market today. With the introduction of the Sat-Fi2, up to 8 devices can have access to Web, messaging and voice services anytime, anywhere. 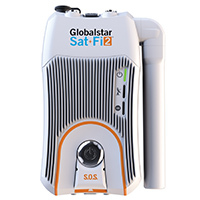 The Globalstar satellite network provides voice and data coverage as well as in-state down-link facilities. That means that we can get area code 907 satellite phone numbers. A recent article on the KTUU2 website points out some of the local VHF dark areas. It is even hard, if not impossible, to get timely weather information. Some overlap does exist with cellular coverage, but once outside of Prince William Sound, there is no cellular at all. Just to get an idea of the actual cellular coverage in our huge state, this telling image from space shows the density of cell towers compared to the rest of the Lower 48. If there could ever be a place in the country where satellite makes the most sense, it is up here in Alaska. Satellite data service is generally expensive and high bandwidth requires substantial investment, with the hardware costing tens of thousands of dollars. The introduction of messaging devices like the InReach and SPOT X offered lower costs, but with messaging as the only feature. Now, the Sat-Fi2 lets you use your own cell phone to make calls and message from pretty much anywhere at a reasonable price. Now, for modest monthly costs, voice, data, and messaging services can be delivered to your own smart phone device using a Sat-Fi2. Have a US based phone number, the freedom to message and get critical data without being tied to cellular. For the next week, ending Friday, June 1, any purchase of a Sat-F12 with service will be offered at a special introductory price of $449. The activation fee will be waived and a free hard carrying case will be included. This is $155 total savings, but you must order by June 1, 2018.